Roulette wheel is the main basis upon which roulette games are classified and categorized. There is an American and European wheels. The European roulette wheel is largely the original French roulette featuring a single zero pocket. This type of roulette is popular in Europe as the name suggests and other parts of the world other than the Americas. The single zero pocket on European roulette is popular all over the world because its low house edge makes its competitive for players. Ordinarily roulette has 36 regular slots numbered from 1 to 36 accordingly and the slots are painted in an alternating manner with the zero slot painted green. This brings the total number slots to 37. Roulette wheel is span to produce winners and losers by way of a small ball resting on one slot and not the other 36. The possibility of the ball resting on one slot is a matter of probability since the ball has an equal chance of resting on all slot but can not do so at the same time. This leaves the probability of the ball resting on one slot at 1 out of 37. An additional slot serves to tilt the game advantage in favor of the dealer and this version of roulette has a house edge of 2.7%. The 2.7% house edge can be reduced to 1.35% incase the rule of en prison applies on even number bets which would significantly reduce the probability of a player loosing his bet. The American version of roulette features a roulette wheel with 38 slots due to an additional double zero pocket. This extra slot significantly increases the house to 5.26% up from the 2.7% on European roulette. Considering that roulette is a game of probability where selecting one number correctly is easier from fewer choices than from many choices, it becomes increasingly difficult to select a correct number out of 38 than 37. The American roulette thus presents players with such extra odds that the game is not even popular in America where it was developed or outside the Americas. The other features such as slots being numbered from 1 to 36 are applicable to both roulette versions and the red and black alternate paintings. Betting rules and other house rules are fairly the same among these roulette variations. Roulette is fairly timely consuming unlike other games. 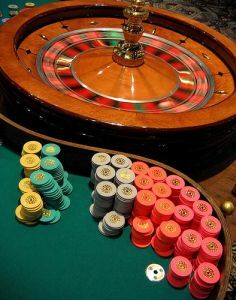 In a steady spinning situation, it would take one hour to spin the roulette wheels about 45 time compared to rolling the dice about 100 time in a similar period. Even blackjack may play nearly 60 hands in a similar duration. This means that a player playing roulette has comparatively less time to make more money than some playing a much faster game. On the other hand you may argue that roulette does not cause you to loose your money fast and that is why it is more glamorous.